I’m preparing for retirement by selling guitars and and paring my equipment down to the items I use most. I’m thinking of space requirements because I’ll probably be living in a home with less space sometime in the future. And I’m thinking about the weight of equipment because I’m getting older and don’t want to hurt my back. I’m even thinking about how likely something will need repairing – because I hate it when things stop working. One of the items I’ve been thinking about is small amplifiers that are good for jazz but versatile enough for blues or other genres. 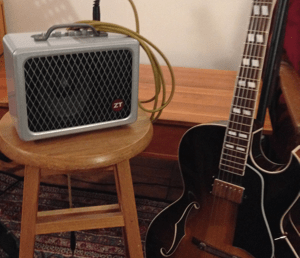 I tried out the QuilterLabs MicroPro 200 8 inch amplifier when I purchased my Eastman AR371ce archtop guitar. 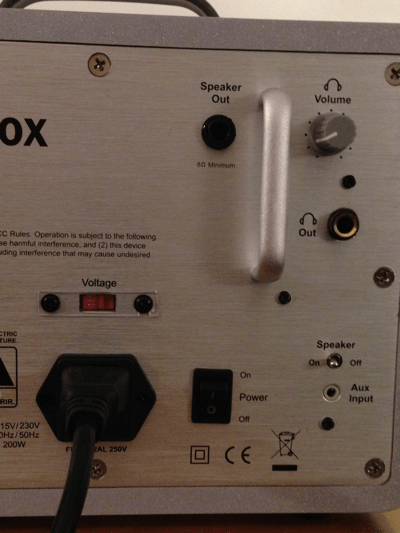 The MicroPro is a high power, solid state amp with 100 watts of power to two channels (200 watts total). It can handle acoustic amplification including a microphone input for vocals as well as a selection of controls to go from blues to rock with some modest modeling ability. It has been getting very good reviews. I thought it sounded good at the shop where I tried it. The 8 inch speaker model is currently selling for about $900. That’s about the same as a new Princeton Reverb or the most I might get (if I were lucky) for my 1976 vintage silver face Princeton Reverb. The amp I use most right now isn’t my Princeton Reverb. The most used amp in the house is a little Vox DA5 practice amp . The next most used amp is an old Line 6 Flextone II modeling amp with a 1×12 speaker and 60 watts power. I love my little Vox. It can run on batteries or use a wall adapter. It’s small and light. It does some modeling but my requirements aren’t difficult – I mostly like a fairly clean sound. The Line 6 sounds fine but it is too big. It takes up too much space and is heavy to move (though lighter than many equivalently sized tube amps). All this is background to what I just did. Just after Thanksgiving I saw a Cyber Monday sale that offered the ZT Lunchbox amplifier for $100 off. That means it sold for $199 instead of $299. That’s $700 less than the Quilter MicroPro 8 inch. I had heard about the ZT Lunchbox series but hadn’t really paid that close attention. So I did some research. Online I found plenty of YouTube videos using the ZT Lunchbox for jazz. You can find other genres as well such as blues and rock. I quickly made a trip to GuitarCenter and tried one out. It sounded really nice in the store. So I ordered one. The ZT Lunchbox is a single channel high power solid state amp with 200 total watts power and a 6.5 inch speaker. There are minimal controls. Basically gain, tone, master volume and ambience. The ambience allegedly allows you to adjust the tone to sound more like an open back speaker. I use it for the same purpose as I use reverb where I like the slightest touch when playing in my study to give a bit more open sound. You can run an external speaker and the internal speaker has an on/off switch. You can plug in an external source in the back to add a backing track. There is a line/headphone out jack with volume control. One of the things I think you need to do when evaluating something like the ZT Lunchbox is to keep some perspective. I didn’t purchase this amp because I expected it to sound better than my Princeton Reverb. I don’t really expect it to sound as good or be as versatile as the MicroPro. It isn’t even as versatile as my Line 6 in terms of amp emulations it can model. But I can find very nice usable tones for jazz or blues on this amp. It is extremely small and the weight is much less than the Line 6 or Princeton. And best of all, the sale price was low enough that I can still consider a MicroPro if I think I need one. So how does it sound. 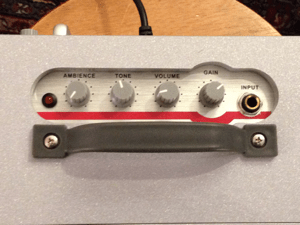 Better than my Vox DA5 practice amp – not surprising. As good as – maybe better than my Line 6, 1×12 – which is a bit surprising. Of course there aren’t as many sounds that can be coaxed from the Lunchbox as from the Line 6 which models 16 different amp models. But considering I use at most three of those amp models, the Lunchbox holds it own. It isn’t trying to emulate a classic amp, only trying to provide a good tone and it does. It doesn’t sound as nice as my vintage Princeton Reverb but it is smaller, lighter, will never need new tubes, is more rugged for travel and sounds good enough for most of my needs. I may never need the MicroPro now but if I do I think I’d still keep the Lunchbox. Was curious what your new Eastman sounded like when put through the lunchbox? At the moment I play through a Roland cube or a Fender Frontman. Not that impressed but can’t afford too much. Don’t use a great deal of modeling-only reverb. I’m a bit of a purist as far as sound is concerned. No pedals either. Describing sound is so subjective I’m not sure what else I can say. I’ll first remind you that your personal preferences may not be the same as mine. That said, I like the sound of my Eastman through the Lunchbox. I too like my sound fairly clean and use no pedals. The lunchbox is loud for its size. I think it does a good job of sounding like those great classic bop guitar recordings. I’m not sure it would sound better than a Roland Cube. But it sounds as good or better than my Line 6 (set to Blackface emulation). I like the sound of my Vintage Fender Silverface Princeton Reverb better – but the Lunchbox actually stands up pretty well against the Princeton. If you’re near to a Guitar Center or other music store I recommend you try one out before buying. Hope this is helpful. Thanks for asking. I’ve been trying to get around to make the video you requested but realize it could be some time before I get to it. It’s a good idea but I just don’t think it will happen soon. In the meantime (presuming I ever make the video), have you seen these ZT Lunchbox videos on Youtube – Mostly Jazz oriented guitar through Lunchbox Amps. Picked up a Level 1 ZT Lunchbox from MF-good price ($158.00) mint condition. Took awhile to dial in but sounds impressive. I would describe output as full but can be made soft as well. Held off shipping LH AR371-CE due to frigid conditions but should have in 2 weeks. Looking forward to playing thru Lunchbox. Any closer to a video?